Graceful acoustic guitar, piano and delicate breathy male/female harmonies bring a cozy wholesome quality to the ultra-soft folkrock trio of Jon Phelps, Lori Kraemer and Ted French. 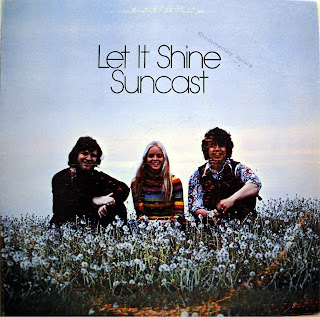 Their custom debut Let It Shine has some nice simple acoustic tracks, including ‘Let Him In’ and the dreamy ‘Sunset’. Electric guitar joins in for the title track which couples the melodies of ‘This Little Light Of Mine’ and ‘Try A Little Kindness’. Be warned, they can tend toward the royally mellow, especially on the occasions when those strings come creepin’ in (‘All My Trials’, ‘Psalm 23’, ‘The Disciple’, ‘The Lord’s Prayer’). Some of those songs recall the smooth light style of Gamble Folk. Overall not bad, but better things lay in store. (The Archivist by Ken Scott, 4th Edition). This has got be one of the most awesome groups I have ever listened to. I never knew there were more albums by them. Thanks a gazillion D-man!!!! I remember this disc, but not well. I want to say these guys were from the Dayton area. I think I had another of their album…beige with sort of a scarlet calligraphy type, maybe? I remember being pretty impressed with them. I think their guitarist was quite good…sorta of an early Keaggy sound to him. I heard this in 75′ when i was 7 years old and this music has stayed with me ever since. Wish someone would upload this album into you tube.